miChele Stinson has over 23 years experience in the healthcare industry. In her role as Senior Executive Consultant for Medical Management Services, miChele specializes in working in a collaborative manner with practice management to address challenges that are often unique to healthcare providers. miChele began her career in human resources with a professional staffing company, where she learned the nuances of recruitment. When she joined the healthcare field her experiences developed into a broad spectrum of human resource expertise, including corporate policy and procedure development and administration, recruitment, strategic business planning, compensation programs, employee relations, benefits, retirement plans, employee health and safety, and ascension planning. 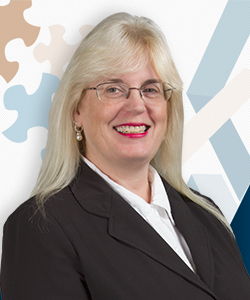 miChele earned a BA in Legal Administration from the University of West Florida, and became a certified Professional in Human Resources in 1994. miChele is a member of the National Society for Human Resources Management and has served in numerous board positions, including president, of her local chapter.